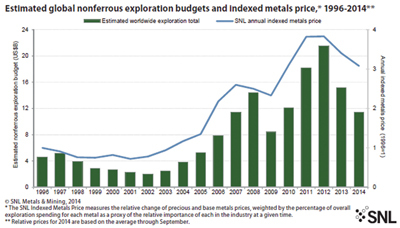 Compiling data for its 25th edition of the Corporate Exploration Strategies (CES) study, SNL Mining & Metals estimated worldwide total budget for nonferrous metals exploration dropped to $11.36 billion in 2014 from $15.19 billion in 2013—a 25% decrease. Higher operating and capital costs, lower ore grades, uncertain demand for commodities and investor discontent have required major companies to focus on a return to healthy margins after years of growth-oriented spending. To that end, the majors have been divesting noncore assets and cutting back on capital project and exploration spending, which has led to an unsurprising 25% drop in the majors’ exploration budget total in 2014. The juniors continue to battle lackluster investor interest, which has forced the group to rein in spending to conserve funds. The juniors’ total exploration budget fell 29% year-over-year in 2014 after falling 39% in 2013, dropping their share of the overall budget total to 32% from a high of 55% in 2007. Exploration allocations for all targets except platinum group metals decreased in 2014. Although gold remains the most attractive target, gold budgets declined for the second consecutive year, dropping 31% to $4.57 billion—to account for the metal’s lowest share of worldwide exploration budgets since 2009 at just 43%. Despite base metals budgets falling by $1 billion, their collective share of total budgets increased 2% to reach the highest level since 2008. 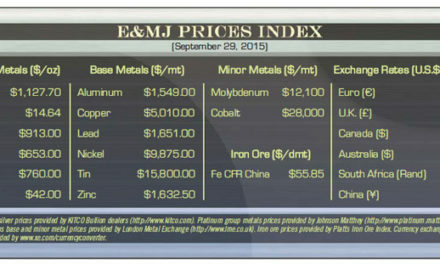 Base metals and gold allocations have a consistently inverse relationship in terms of their shares of overall budgets. Despite lower allocations for most countries, companies continue to explore across the globe; exploration is planned for 124 countries in 2014, down from 127 in 2013. The share of budgets allocated to mature mining regions such as Canada and the U.S. fell in 2014; Canada’s total budget was down 22% year-on-year due to weakness in the country’s junior sector, while the U.S. total declined 27% as many major copper producers scaled back exploration programs. Canada and Australia remained the top countries overall, with the U.S., Mexico and Chile rounding out the top five. Although Latin America’s 26% year-over-year decline is relatively on par with the overall decrease in exploration budgets in 2014, two of the top exploration destinations within the region, Argentina and Colombia, saw declines of 46% and 42%, respectively. For the first time since SNL Metals & Mining began the series of CES studies, the proportion of overall exploration budgets dedicated to mine site work surpassed the budget for grassroots activity. Since 2012, producers have been increasingly emphasizing brownfields programs as a less capital-intensive and less risky means of replacing and adding reserves. The proportion of the annual total allocated to grassroots exploration hit a record low this year. This reduced focus on early stage and generative work has led to concern that many companies, and perhaps the industry in general, are sacrificing long-term project pipelines in favor of consolidation and maximizing returns.